Honeywell developed the bi-optic hybrid in-counter scanner Stratos 2700 for the utmost scanning requirements. What makes it so special? It contains an omni-directional laser scanner plus a 2D area imager. The combination ensures for incredible performance at the checkout, as well as a consistently high speed, even during peak times. With 21,500 scans per second, it reliably and quickly captures 1D, 2D and PDF codes. For most products it is not necessary to line up the barcode with the Stratos 2700, because it captures the barcode from any side of the product within the scan area, thanks to its 360°-capture technology. 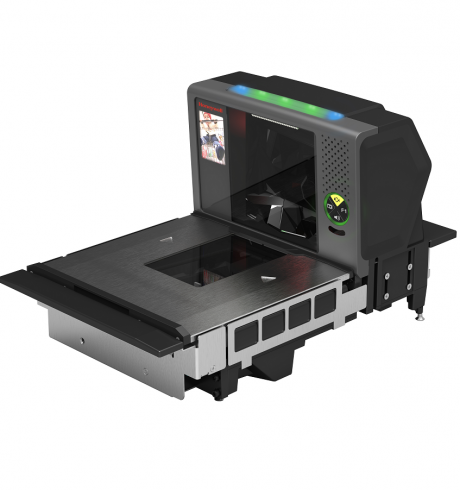 This saves valuable time, allowing checkout personnel to perform pass-through scanning, even with very small articles. Additionally increase the functionality of the in-counter scanner with an optionally integrated scale for vegetables, etc. Versions with different-sized weighing platforms are optimally adapted to the hardware. Should your needs change, retrofit all modular components on-site. The scan window is made from either durable sapphire or diamonex glass, to provide extra security during hectic daily operation. Even hard or oversized items do not pose any harm to the glass. The Stratos 2700 features a built-in LCD display, directly next to the scan window, so it is always in plain sight of the user. Automatic text messages appear when technical problems occur, to provide a live diagnosis. Together with any standard camera you utilize practical live video surveillance of the cart at the checkout, for example, monitoring items stored underneath. This is an easy way to reduce the number of forgotten items and goods in the cart. For increased security opt for the EAS antenna (Electronic Article Surveillance), which protects items from theft. A counterpoint and EVOLVE antenna are integrated, standard; additional versions are optionally available. (The compatible connection is available, as well as 2 USB and 2 RS23 ports and a video connection.) When it comes to maintenance and service, the Honeywell Stratos 2700 is ideally conceptualized. One tool is all you need for all the important parts, allowing you to keep repair downtimes to a minimum, which also increases overall productivity. Manage, configure and update the scanner and any connected devices remotely via Remote MasterMind. Be sure that all connected devices run with the same software tools and updates.